Lil’Stylers, a new shopping discovery service launching first on the iPhone, has a different (and maybe unsettling?) take on tracking children’s fashion trends. 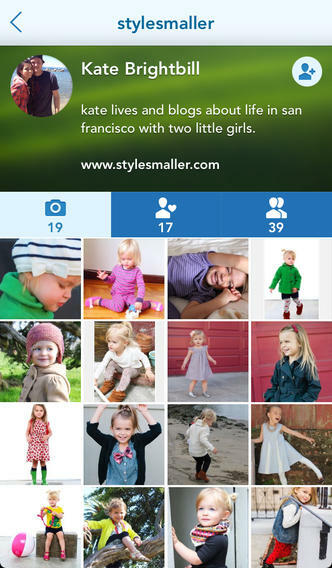 For those following mobile shopping space, the easiest way to put it is to say it’s a “Pose for kids.” To better explain what that means, Lil’Stylers is an attempt at building a social community around sharing outfits, looks, style ideas, and favorite brands to help inspire parents looking for new ideas in children’s fashion. The potentially icky part? The unwitting participants in this new community are your own kids. Say cheese, kiddo, momma wants to earn some style points for having the best-dressed little bugaboo. Of course, today’s kids have been born into a world of the over-share, where entire social communities have been built up around the concept of doing fun, new things with selfies. (Cough, FrontBack, cough). And I’m not going to lie, my kid’s photos have been around the internet already, on social services like Facebook and Instagram, for example. I also upload our family photos to various cloud services, like Google+ and Flickr, where I might not have always remembered to set the privacy toggle on. I also once used a picture of my kid (as a baby) here on TechCrunch, but I at least had the decency to feel pretty bad about it later. So where exactly is the line between sharing on Facebook with people I know, which turns me into a potentially monetizable user who clicks on ads and makes Facebook money, and sharing my kid’s photos with strangers for the purpose of commerce? It’s a gray area these days, to say the least. Lil’Stylers founder Eric Dillon also points to today’s photo-sharing trends in justifying the service’s push to have parents photograph, then share the photos of their kids with a larger community for the purpose of fashion inspiration. And when I point out that there will be some parents out there who may find such a thing a bit touchy, he agrees. Ah, so Lil’Stylers will mainly take advantage of the moms (and dads maybe, but honestly, mostly moms) who tend to overexpose their kids anyway? Well, that will fly in the mommy blogger community then. (And, well, yep.) Mommy bloggers have long since positioned themselves as brands’ friends, and many are already working with these companies, so to lean on them for Lil’Stylers curated user-generated content makes sense. And eventually, assuming the service grew large enough, those mommy bloggers could participate in revenue-sharing agreements with Lil’Stylers, which is today monetizing from affiliate sales. I should also point out that the app offers a privacy setting which would allow users to only share their children’s photos with a close circle of family and friends. It’s off by default, but it’s at least an option for those on the fence about whether or not they should post. Outside of these concerns, the app itself is great. It has a clean, modern design, where photos are tagged with the appropriate brand names. Over 100+ kids clothing brands are represented in Lil’Stylers, too, including Desigual Kids, Pale Cloud, Il Gufo, Nununu Kids, and others. Many brands have taken the time to sign up, create profiles and look-books inside the app, and will regularly post their own pictures, says Dillon. You can already shop the brands which have created profiles by tapping on the photo tags’ with the icon of the shopping bag next to them. These takes you to the brand’s profile page where you can follow their own shares, and visit their site. Though only weeks old, the app has already seen some 17,000 user sessions from its small, but active early adopting community of over 700 parents, who have shared thousands of photos. Dillon says Lil’Stylers will grow its user base initially by targeting the mommy bloggers as well as other bloggers and influencers, as well as reaching out to more kids’ clothes brands. The company is also in discussions with larger retailers, he adds. And to get its name out there, it’s doing marketing stunts, like this recent kids’ fashion show, for example. Seattle-based Lil’Stylers is co-founded by longtime software development manager Dillon and Kirti Baliga, whose background is in merchandising. Dillon, a father of two, says that the idea for the company came to him because “where did you buy that?” is a common question parents already ask each other their kid’s clothing. With Lil’Stylers, the hope is to broaden those parent-to-parent recommendations further. The company is currently bootstrapped, and both founders are working their full-time jobs until month-end. You can download the Lil’Stylers app here in iTunes. Should you? You decide.